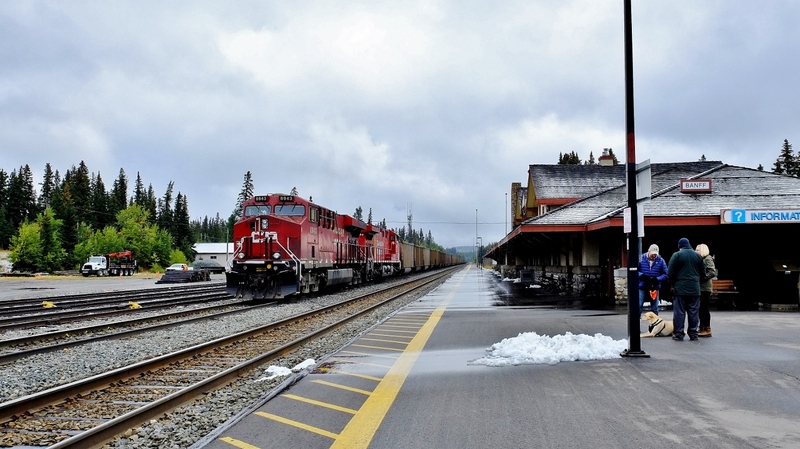 Railpictures.ca - B Danko Photo: CP8943 west with 8134 and dpu8760 end of train, potash loads await westward signal At Banff Alberta on a chilly +4c Sept 16, 2018 afternoon; image by B Danko what’s interesting Banff station very nicely restored (completed 2017 ? ) – especially given its prior condition ( and when The Canadian last operated on CP Rail ) – I believe the Station is privately owned / operated. Today Banff station transportation services provided by ROAM ( half hourly local transit ) ; National Parks shuttles (hourly summer season May through October ); Rocky Mountaineer ( infrequent whenever RMR wants to ) and…… Greyhound daily ( ! ) tenants include National Parks kiosk, Rocky Mountaineer, and Greyhound ( ! ) ! oh, Greyhound, as of Oct 31, 2018 quit all routes west of Sudbury ….seems to me one of the reasons your Government yanked VIA off the CP Rail transcontinental route cause Greyhound provided frequent daily or better service on the parallel TCH ! ! its a long shot: This summer past a private proposal to restore Banff – Calgary rail passenger service was tabled with some private funding in place, the 81 mile ( 131 km) rail route would parallel the CPR, estimate rail costs $5 million per KM sdfourty | Railpictures.ca – Canadian Railway Photography – photographie ferroviaire Canadienne. Copyright Notice: This image ©B Danko all rights reserved. Banff station very nicely restored (completed 2017 ? ) – especially given its prior condition ( and when The Canadian last operated on CP Rail ) - I believe the Station is privately owned / operated.
! oh, Greyhound, as of Oct 31, 2018 quit all routes west of Sudbury ….seems to me one of the reasons your Government yanked VIA off the CP Rail transcontinental route cause Greyhound provided frequent daily or better service on the parallel TCH ! ! Summer service sounds like a great idea, but wouldn’t it make more sense to just double track the whole thing rather than a separate line? Something to dream about anyway! !